Contact the owner at 989-550-8720..Corsair F-24 MKII Hull # CRS20313B000 Year built,2000. Loaded with quality equipment: fresh water for last 13 years. 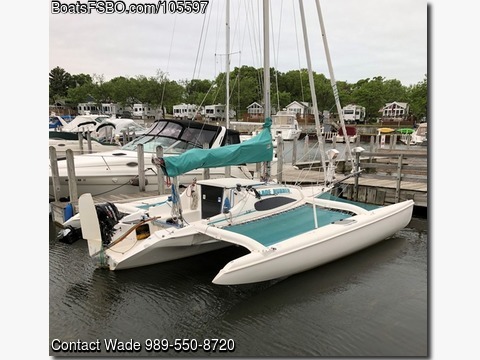 Asking Price $38,000.00 SAILS: Main sail: Doyle 2015 Fat Heads Older Calvert Main sale Jib:Kent 2017: Harken Furler; Old Calvert Jib Screacher: North 2016; Facnor furler Asymetrical: Kent Sale; Selden top down Furler Storm Jib; Calvert Hank on (Never been used). POWER:Mercury 2016, 9.9 hp Kicker, Electric start, Generator Power tilt, 3 gal gas tank. NAVIGATION: B&G Vulcan Plotter; NEMA 2000, touch screen GPS Ipad compatible, Bluetooth compatible B&G V50 VHF: AIS, DSC, NEMA 186 & 2000 B&G Hand held VHF remote for cockpit Nexus: Knot, Log, water temp, Depth, Wind compatible. ELECTRICAL: @ 12 V Marine Batteries, solar panel, Battery selector switch, Cabin florescent light LED running lights and deck light. TRAILER:FE single axel, surge brakes, Tires less than 1000 miles Spare tire. MISC: All sail controls led to cockpit, 4 stoppers on cabin top, 2 single speed winches with self tailers, 2 2speed winches on Cowling, spare pawls and springs, sunrise nets 2009, Lazy jack system, pop top camping cover, cushions, carpet, Porta potty, storage bags, extended bow sprit, MOM horse shoe Hull support stands for painting bottom, mast raising wires, Bilge pump, Fortress anchor with 10 ft chain + 200 ft nylon rode. STORAGE:Winter storage inside last 12 years.